Not interested in Bellingham ? Please choose a different community. Students will engage in daily opportunities to develop as strong, thoughtful artists through classes in contemporary technique, classical and contemporary ballet, conditioning, workshops, and repertory sessions. In these sessions dancers learn choreography from the company’s portfolio of work from nationally recognized choreographers. 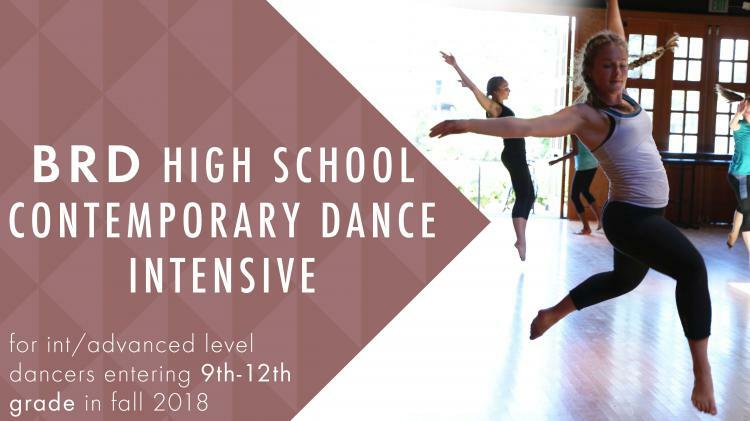 Intermediate/advanced dance students (entering grades 9-12 in fall 2018) with at least 2 years of dance training, or special permission by a BRD member, are invited to participate. Learn more about BRD at click for details and follow us on Instagram @brdancers. Email bhamrep@gmail.com for more information. Bellingham Repertory Dance is a collective of accomplished dancers dedicated to bringing high-quality, vibrant contemporary dance to Bellingham. As a dancer-driven organization, BRD members share performance, administrative, marketing, production and artistic direction duties. Established in 2005, BRD has built a reputation for producing fresh, engaging, diverse, audience-pleasing concerts that appeal both to established Modern Dance enthusiasts as well as to new audiences.The Company creates opportunities for accomplished dancers in our community to perform sophisticated, audience accessible works, and additionally creates professional-level opportunities for established and emerging choreographers. BRD is a 501(c)(3) non-profit. All of the dancers’ time is donated – none are paid. For funding we rely on ticket sales and fundraising events, as well as monetary and in-kind donations from friends, family and supporters of dance.